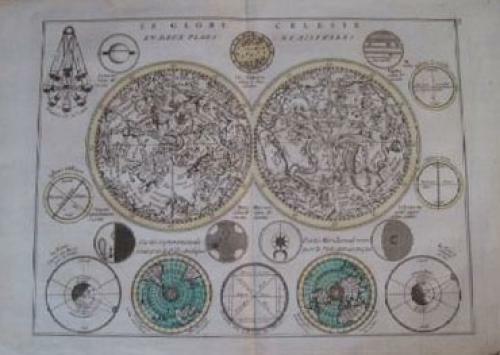 Title: 'Le Globe Celeste en Deux Plans-Hemispheres', printed in the 1746 edition of the "Atlas Nouveau Portatif"
A charming double hemisphere (north & south) celestial chart. Smaller terrestrial hemispheres. Surrounded by diagrams showing illumination of the moon and the earth's path around the sun.